Google has been a major player in the online travel space for a while, now offering a range of products for travelers from Maps and Trips to Flights and Hotels. Google reviews have always played a pivotal role in trip-planning, so it was only a matter of time before the company turned its attention to its review product. And check out the results! 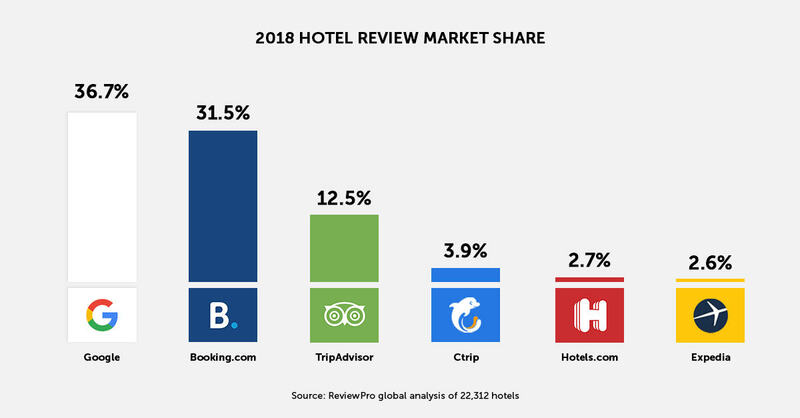 In a recent ReviewPro analysis of over 22,000 hotels around the world, Google was found to be the biggest source of reviews. From 2016 to 2017 Google reviews grew by 309%, and an additional 114% from 2017 to 2018. The change has happened so fast that many hoteliers are struggling to keep up. The good news? For ReviewPro’s next webinar we are partnering with Google to share the latest data, trends, and strategies related to Google reviews. Procedures and policies for monitoring, acting on and responding to Google reviews. Last but not least, Danica Smith, Product Specialist at ReviewPro, will show us how to use ReviewPro to manage review distribution and benchmark your property’s performance. Don’t miss this rare opportunity to hear straight from Google and other industry experts! If the time doesn’t suit, register anyway and we’ll email you a link to the recording after the event to watch on demand. Would you like to see how our tool can help you manage guest reviews?